explorASIAN 2013 is featuring “ Generation One Art Exhibition” to celebrate this year’s Asian Heritage Month. The exhibition is one of explorASIAN 2013’s signature programs, produced by VAHMS artists & community partners in multiple locations in Metro Vancouver, and showcases Asian-Canadian artists’ creativity and vitality. This year’s program will feature both established local artists, as well as emerging artists who are first-generation Canadians, with an intention to cultivating the appreciation of visual arts among youths. 1. Generation One 2 & 3 Dimensional Art Exhibition @ Asian Centre Auditorium, UBC, May 20th to 27th, 2013. Gallery Hours: 10:00am – 6:00pm Monday to Sunday. Free admission; 1871 West Mall V6T 1Z2. A special purpose of this year’s art exhibition is to put the spotlight on local young artists and established masters who are either home-grown first-generation Asian-Canadians or new immigrants. 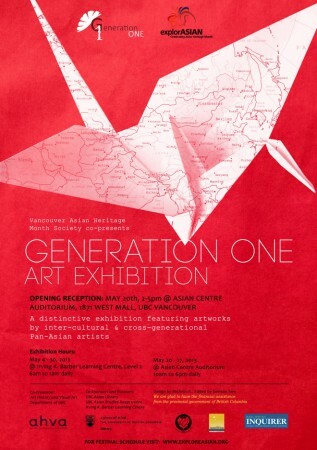 In order to nurture and support young local talents, Generation One Art Exhibition together with UBC Art History and Visual Art Department (AHVA) will co-present this week-long exhibition at the Asian Centre Auditorium from May 20 to 27, 2013. This exhibition of paintings and calligraphy by local young artists from a Pan-Asian cultural spectrum – from the Middle East to the Far East. This exhibition produced by VAHMS will also feature established masters’ works to stimulate inter-generational interaction and learning. In addition, special activities will be hosted on site during the exhibition period to foster intercultural dialogues and exchanges among the artists and with the public. AHVA Curator of Generation One 2013 is professor Xiong Gu. The exhibition Opening Reception is on May 20, 2013 from 2 to 5pm. There will also be a solo featured artist for the year, Mr. Edgardo Lantin (see his full biography and artwork on his website), who will demonstrate portrait paintings during our Opening. Do not miss the chance to meet with different Asian artists and come to celebrate Asian Heritage Month in Vancouver! 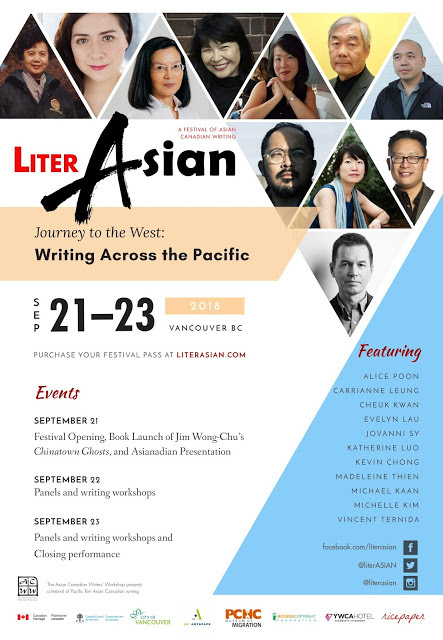 You will see various collections from Vancouver Asian Artists. 2. Generation One 3 Dimensional Art Exhibition @ Irving K. Barber Learning Centre, UBC, May 4th to 30th, 2013. Gallery hours: 6:00AM – 1:00AM Monday to Sunday. Free admission; 1961 East Mall, Vancouver. 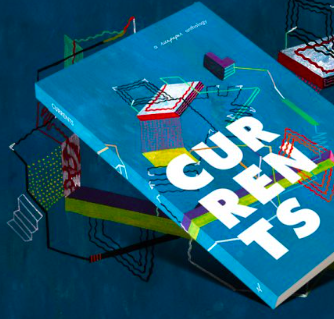 Featured Artists include: Jong Jin Lee, Evan Leung, Ilsoo Kyung MacLaurin, and Ping Wong.